U.S. President Barack Obama speaks during a news conference at PGE National Stadium in Warsaw, Poland. WASHINGTON -- For President Barack Obama, the decision to return early from an overseas trip after a series of shocking shootings will prove to be easy compared to his next challenge: Comforting an America that has witnessed a rash of shootings. After arriving from Spain late Sunday, Obama will fly Tuesday to Dallas, the scene of the massacre of police officers that, on the heels of two caught-on-video police shootings, has emerged as a tipping point in the national debate about race and justice. Obama is due to deliver remarks at an interfaith memorial service and is expected to meet with victims' families and with local law enforcement officials mourning their own. To some degree, the trip is a familiar ritual for a president who has embarked in recent years on similar consolation missions with relentless frequency. But it's clear that Obama views the moment as distinct. In choosing to the deliver a speech, rather than a private visit with families, Obama has tasked himself with ministering to Americans as they make sense of a frustrating cloud of issues swirling around the shootings. The president sees delivering this sort of guidance a core part of his leadership, so much so that some of his memorable speeches were in honor of mass shooting victims, including his challenge to protect children from guns in Newtown, Conn. - "We're not doing enough." - and his singing of "Amazing Grace" after the shooting in a black church in Charleston, S.C. But it's far from clear whether these moments fostered movement - either on legislation or race relations - and Obama has had to face the limits of his rhetoric. As he has in the past, Obama will search this week for a way to break through. As he traveled to Poland and Spain last week for meetings with European leaders, the president was publicly working through his thoughts. At times, he acknowledged "anger" and "confusion" in the public, and at other times he seemed to downplay the enormity of events. On the shootings by police of black men in Minnesota and Louisiana, Obama called for more activism and reforms. And he sought to impress upon white Americans what he said he and other African Americans already know: The problem is real. On the shooting in Dallas, Obama cast Micah Johnson, the sniper killed in a standoff with police, as "demented" and his motives as unknowable. People should not believe that "the act of a troubled individual speaks to some larger political statement across the country," he said. "It doesn't." 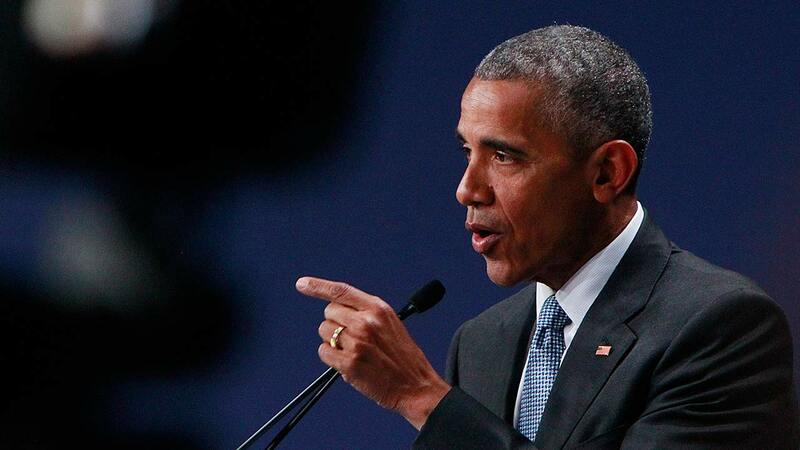 Obama also pointed to other forces driving discontent at home and in Europe - lone-wolf terrorism or economic instability wrought by globalization - and tried to sell his policies aimed at each. The comments highlighted this president's rationality and a tendency to analyze people's fears rather than validate them - both traits that at times have limited his ability to connect. Asked Saturday about rising worries about safety, Obama cited crime statistics. He bluntly dismissed comparisons to the domestic turbulence of the 1960s as overblown. "That's just not true," he said. Obama's remarks also captured the president continuing to try to serve as bridge builder between white and black Americans, protesters and police. It's a role that helped catapult him to political stardom, but one he's struggled to inhabit as president during a period of sharp political polarization and continued racial tensions. Still, Obama wasn't about to cede the role this week. White House officials said the decision to trim his trip to Spain by one day was driven in part by not wanting other, divisive voices to fill the void left in his absence. On Sunday, a few hours before returning home, Obama tried again to walk a center line, as he issued a plea for better understanding between police and demonstrators taking part in the protests across the country. "I'd like all sides to listen to each other," he said.